Over 20 years ago, we tore this recipe out of the pages of Bon Appetit Magazine because it looked tasty and seemed relatively simple to pull together. While sous chef-ing in a restaurant all day and anticipating the arrival of friends at our house afterwards for our own holiday meal, there was no time for complicated preparations. Although our homes and Friendsgivings have evolved, our commitment to this beloved turkey recipe remains. We’ve streamlined it a bit over the years, and shared it often with friends preparing their own inaugural Thanksgiving meals. 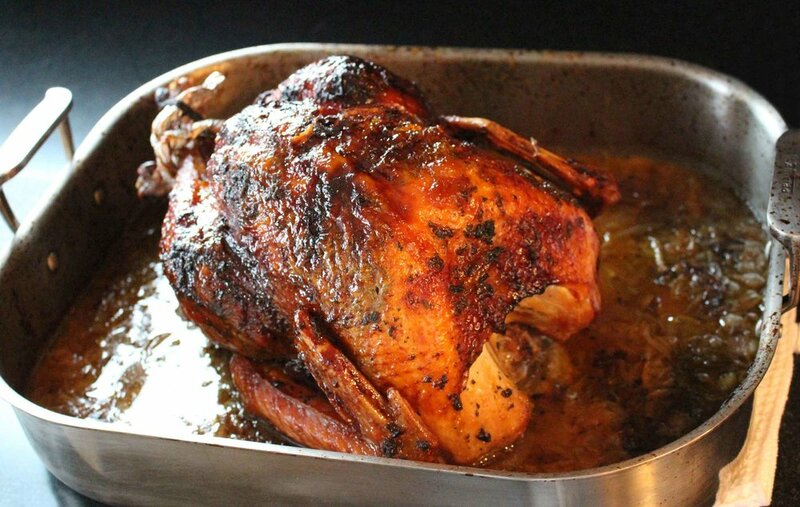 Roasting a turkey evokes anxiety in so many home cooks who never bat an eye about roasting a chicken. Approach it with the same confidence. Turkey is intrinsically a bit dryer, and the bird is likely bigger, so take extra care to baste and watch the temperature of the meat so it doesn't overcook. And if you get distracted, this gravy has your back. It's sweet and savory all in one and comes together with the buzz of a blender. The very few turkey photos shown here are from last year's meal. For us, when it's time to sit down for Thanksgiving dinner, the camera is retired as there is nothing better than sinking into a gravy-dressed slice of turkey and enjoying the wonderful people who join us at our table. We look forward to Thursday with both anticipation and gratitude. We give heartfelt thanks to all of you who have spent time with us at Thread & Whisk this year, joining our cooking and making endeavors and supporting us as we create our goods. Our sincerest wishes for a Happy Thanksgiving go out to you. Herb butter, onion mixture and glaze can be prepared 1 day ahead. Bring herb butter to room temperature before proceeding. HERB BUTTER: Blend all ingredients in small bowl. Set aside. ONION MIXTURE: Melt butter in heavy large skillet over medium-low heat. Add onions and shallots and sauté until very soft, about 15-20 minutes. Set aside. APRICOT GLAZE: Combine all ingredients in heavy small saucepan and bring to boil. Reduce heat to medium-low and simmer until thickened and reduced to 1-1/4 cups, about 15 minutes. TURKEY: Make sure that your turkey is completely defrosted if purchased frozen. Leave on kitchen counter for about an hour before preparing/putting it into the oven. Position rack in lowest third of oven and preheat to 400 degrees F. Pat turkey dry with paper towels. Season turkey cavity with salt and pepper. Place turkey in large roasting pan. Slide hand under skin of turkey breast to loosen skin. Spread half of herb butter over breast, underneath skin. Place remaining herb butter in a small saucepan. Stir over low heat until melted. Brush butter over outside of turkey. Using butcher’s twine (or a twisted up piece of foil), tie legs of turkey together to loosely hold shape. Put turkey in the oven and roast for 30 minutes before reducing oven temperature to 325 degrees F. Continue to roast turkey for 90 minutes, basting occasionally with pan drippings. Tent turkey with heavy-duty foil; roast 30 minutes longer. Add onion mixture, broth, thyme and sage to bottom of pan. Roast 15 minutes. Bring apricot glaze to simmer. Brush 1/2 cup glaze over turkey. Continue to roast turkey uncovered until meat thermometer inserted into thickest part of thigh registers 180 degrees F or until juices run clear when thickest part of thigh is pierced with skewer. Add more broth to pan (if liquid evaporates) and continue to brush occasionally with glaze until turkey is done. Place turkey on a large platter, tent with foil. Let stand for 30 minutes before carving. Reserve mixture in pan for gravy. Carefully pour contents of roasting pan into a strainer set over a large bowl. Transfer onion mixture from strainer to a blender. Add 1 cup pan juices and blend until smooth, adding more pan juices (and chicken broth if needed) to thin sauce to desired consistency. Transfer sauce to heavy large saucepan and bring to boil for about five minutes. Season with salt and pepper to taste. Cooking stuffing separately is a method we adopted long ago. It simplifies the turkey roasting process as well as the entire meal preparation. The bird goes into the oven first, and then you can focus on a stuffing of your choice and other side dishes while it cooks.